A young woman (Mary Elizabeth Winstead) wakes up in a cellar after suffering a severe car accident. The man (John Goodman) who claims to have rescued her enters the scene and informs her that a catastrophic chemical attack has left the outside world uninhabitable. She harbors her doubts, however, and eventually musters the courage to escape, despite whatever dangers may lurk beyond the cellar walls. 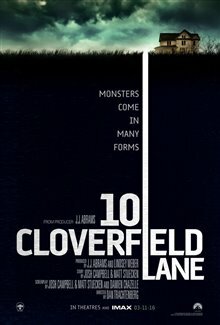 Not a direct sequel to 2008's Cloverfield, the film is dubbed "a blood relative" of the thriller. 10 Cloverfield Lane movie clip - "You Can't Leave"
10 Cloverfield Lane movie clip - "Do Not Let Her In"
10 Cloverfield Lane TV Spot - "Be Prepared"
"Dumb... from start to finish. Was not impressed." "Totally under rated film! 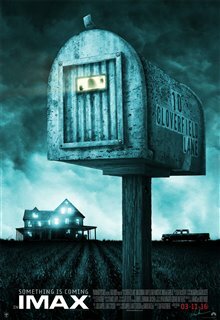 Very suspenseful - keeps you guessing to the very end (sort of) and John Goodman is fantastic in the role." "As others have mentioned, this is not a sequel. Having never seen its earlier namesake, I walked into this blind; but it turns out you can live as a mole after all, just in fear. Help yourself by escaping from your life to see this film. It's worth it for the ride and the destination. S. from Toronto."